When I got a bit more serious about my college education; that is I realized I couldn’t make a living in fine art or my then minor, beer, I transferred to the University of Southwestern Louisiana (USL, which is now ULL, the University of Louisiana at Lafayette) and changed majors. I had heard they had a good program in advertising design, and that sounded like something that might actually generate some income. Sam made the trip with me, having come to the same conclusion about fine art, but Richard was doing a stint in the Army National Guard. Sam and I got a new roommate, Alvin Bartlett, who we knew from high school, and moved into an apartment on St Joseph Street. Al had just finished up his active duty time in the Navy Reserves. Al was just as crazy as Richard—and Sam and me, for that matter. The Petty Wars continued with new vigor and fresh creativeness. Sam came home one day with a device about the size of a quarter and twice as thick, that you put in a socket behind a light bulb, and it would cause the light to blink. We installed it in the light over the bathroom sink and departed for the weekend back to NOLA, leaving Al to hold down the apartment. When we came back, Al complained about the blinking light. He said he had finally managed to time his eyes to blink with the light and shave at the same time. We quietly removed the blinker and suggested Al should get his eyes checked, because the light worked fine for us. One favorite trick was to wait until one or the other of us was taking a shower, sneak into the bathroom, and douse them with a pitcher of cold water. Much profanity and threats of death emanated from behind the shower curtain after such dousings. I upped the ante one evening by adding lots of sugar to the cold water and waited for the target, which happened to be Al, to turn off the shower before dousing him. The usual death threats and profanity were forthcoming from the cold dousing, but Al simply proceeded to dry himself—until the towel started sticking to them. One evening Al and I were cooking onion rings for supper, and Sam was scarfing them up as fast as we fried them. So…we twisted some pieces of paper towel into onion ring shape, battered them, and fried them up. Sam, naturally, stole them and ate them—and swallowed them, only to complain of how tough they were. Then there was the famous sandwich caper. We were at the apartment for lunch and fried up some bacon for BLT sandwiches. Al and I finished ours, but Sam had only just finished making his and hadn’t even started eating yet. I informed him I was still hungry and could I please have a bite of his sandwich? Suspecting some trickery on my part, like stuff the whole sandwich in my mouth, Sam thought he was going to be clever. He smiled and said, “Sure,” whereupon he picked up his sandwich and licked the bread on one side before he handed it to me with a broad smile of triumph on his face. Even Al figured he had me that time. Eventually, the local garbage men became targets-of-opportunity for our pranks. We lived in a the second floor apartment (the one on the left in the pic above), and our kitchen table was located under the front window. Window open on a warm spring day, we had a good view of the street as we ate lunch when the garbage truck came along, making their garbage collections. They had a system worked out. The nearly-asleep truck driver stopped the truck positioned so the back was near the garbage cans to be dumped. The “can-handler” dropped off the little step on the rear of the truck where he rode, grabbed the can, tossed its contents into the hopper in the back of the truck, tossed the empty can over on the sidewalk, and whistled for the nearly-asleep driver to move on to the next set of garbage cans. Timing must be perfect, and it was. We waited until the “can-handler” was just about to dump the can and whistled. The half-asleep driver pulled out, and the contents of the garbage can ended up in the street. Not wanting to be reported by our neighbors across the street whose garbage was strewn all over St. Joseph Street, he had to pick it up. Much profanity issued forth from the can-handler, while the half-asleep driver waited patiently down the street at the next set of garbage cans. My favorite story did not involve me. 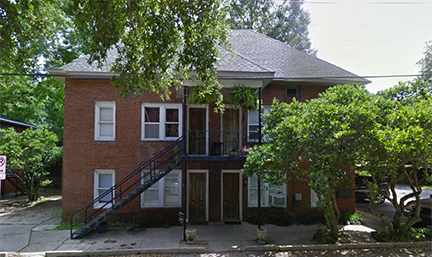 I was living in the frat house at the time, and Richard, fresh out of his six months active duty with the Army National Guard, had joined Alvin and Sam on St. Joseph Street. Alvin worked for CLECO (electric utility in Lafayette) and had to get to work around 7am. Sam and Richard set his clock ahead an hour, so Al woke up an hour early and arrived at work an hour early—only to find the gate locked. He should have been suspicious when he left the apartment with the sun just coming up, and usually, it was well up when he left. He probably wasn’t fully awake yet….